After the tremendous success of Elvis back on stage and touring in 1970, somewhat surprisingly, Colonel Parker arranged only one tour for Elvis in 1971 - just 14 shows away from the routine casino atmospheres of Vegas & Tahoe. 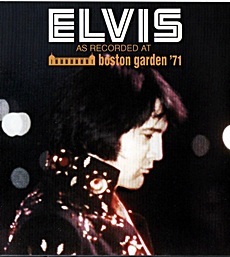 ‘ELVIS - As Recorded At Boston Garden '71 ’ (a neat homage to MSG concept and cover) from November 10, 1971 was the only time Elvis ever played in Boston - and with such a successful show it is a real surprise that he never returned. EIN’s Piers Beagley checks out the recent FTD CD release.. Personally I am always happier hearing Elvis work a larger tour crowd than the usual Vegas audiences and this is no exception. Elvis always raised himself to a challenge and after the Vegas Summer Season, of 57 shows in a row, he was bound to be more inspired. This November 1971 Tour was also the first time Elvis used J.D Sumner & The Stamps who had just replaced The Imperials. While this FTD comes in a regular digipack, the extra 8-page booklet features some fine photographs that show Elvis in his great Black Matador jumpsuit. The booklet also features an eyewitness essay by Cathi Avenell that helps describe the excitement of being there. Her unique photos are also used in the booklet. … "At last the lights came down and finally the orchestra started up and seemed to go on forever. I really thought I could have jumped out of my skin. It was so hard to wait but then there HE was. I think I stopped breathing. There was no one else in the entire Boston Garden. Just me and Elvis, this man I had loved for 15 years, was here in the same room as I was - he was beautiful! I was happy to see him in a black suit and not white. In all of the shows I had read about up to that point he wore white so that made this show seem extra special. I think it took me about 20 minutes before I even remembered the very expensive camera in my hands, especially as my mother was now screaming in my ear - it's Elvis! Elvis sounded just perfect to my ears but in a blink of an eye it was over. This Boston Garden concert helps explain it all. Rolling Stone writer Jon Landau noted in an article at the time..
"Elvis sings like an angel and moves like a ballerina, and he left me struck dumb. He was far from through, and after some cooler numbers designed to let people settle down, he went into what I thought was the finale, "Suspicious Minds". Here, he did with an up- tempo song what he had earlier done with a slow one; he got everything out of it that is there. It is a beautiful song, the best Presley has done since he stopped making the movie sound track albums and by the time he finished you knew that underneath the control and the lightness of most of the evening's music there stood a man with more natural ability, talent, and soul than I expect to see on the stage at any rock concert." This concert is super-important for being such a fantastic quality soundboard recording of such a short tour. While is has been out several times on Bootleg (see EIN’s old Madison bootleg review here) if you are a fan of Elvis this is the ESSENTIAL concert to own from 1971 and FTD are right in releasing it even if previously available elsewhere to those in the know. Fans do still have to understand that although this is a great quality soundboard recording it is still from a cassette recorded 35 years ago that was never destined for release. So while I do agree that the sound is extremely good for a cassette at times there is still nothing that can be done to improve the overall original mix & the annoyingly loud backing-vocals, or trumpet, at times. This is not a multi-track professional recording like the quality of ‘Afternoon at The Garden’ nor like the sensational sound on FTD’s recent ‘The Wonder Of You.’ This is just a very good quality mono cassette with a surprisingly good clarity & bass sound. Bootleg fans might be interested to know that in comparison to Madison’s ‘One Night Only ’ the audio quality on this FTD is very similar. There is a slight variation in compression and the slight rasping top-frequencies have now been toned down on this FTD for the better. At times one might think that FTD had used the "One Night" bootleg as the source since they are that close, however that is not the case. However for an original cassette soundboard the sound is very clear indeed with a nice crispness on the percussion. The openness of sound gives you a great feel of being at the concert. It is certainly a much more involving experience than the Vegas 1971 FTD ‘The Impossible Dream’. In the end of course it is in fact Elvis’ new found excitement of being On Tour and playing to larger crowds that makes this CD so damn fun. The rumble of ‘Also Sprach’ as always gives you a feel of the venue and the build up to Elvis as he explodes on to the stage (James Burton’s guitar initially starts off loud & distorted but is quickly fixed). ‘That’s All Right’ is a powerful start and the sound of the audience is picked up by the microphones giving you the excitement of the 15,500 crowd that soundboards sometimes miss. "One more time.. yeahhhhh" calls Elvis who is powering through in great form. There’s a cute tempo-hiccup at the beginning of ‘I Got A Woman’ - "Don’t tell me to wait a minute" Elvis says to the band - he’s on fire and wants to keep on burning! You can hear how Elvis is really soaking up the band & backing singers as the song rocks along. At 01.37 Elvis blasts, "Well, she’s my baby, don't you understand?" and for a soundboard there is a good mix of crowd reaction which lets you get the overall feel of being at the concert. ‘Proud Mary’ rocks with freshness as Elvis had only started using it as a regular since the previous Vegas Summer season. Elvis burns up energy through a powerful ‘You Don’t Have To Say You Love Me’ and goes straight into a fabulous ‘You've Lost that Lovin' Feeling’ where you can really feel Elvis working the 15,500 crowd as he growls, "Baby, baby, I get down on my knees for you". This is where the call & response from The Sweets really works well. Has a great deep-bass "Lord, Lord Lord Lord" ending from Elvis. ‘Polk Salad Annie’ gets a great work out – it’s an exceptional version – out on tour Elvis is still telling his ‘little story’ (although he had dropped the intro previously in in Vegas) and cleverly uses it to work the crowd into a frenzy. Explaining the tale Elvis laughs, "I used to know a girl lived down there – weird old chick! Whooo!" Jerry Scheff works the bass, Ronnie Tutt drives the drums, the brass is crisp & clear and the crowd claps along. Knocking this out to an appreciative big auditorium has got to beat the jewellery rattling casino crowd – and it shows. It is a fabulous fun & funky version! Listen out for Elvis’ great growl, "Yeaaahh" @ 3:30. A knock out, crank it up! Even the oldies get a sincere workout especially compared to later versions. Here after 5 Vegas seasons Elvis is still singing ‘Love Me’ with feeling. ‘Heartbreak Hotel’ has the crowd so wild that the band stops & restarts while ‘Blue Suede Shoes’ has Elvis laughing and dancin’ in his shoes. Similarly ‘One Night’ is a brilliant rockin’ bluesy version. Not a regular in 1971 Elvis had only sung it one at his recent Vegas season. Elvis sings, "Just call my name" and the crowd shrieks back "ELVIS" at him. It’s a great moment. Perhaps the real disappointment is that the delicious ‘How Great Thou Art’ is incomplete – it fades out at 2 minutes - as the cassette was turned over at this point. After The Introductions Elvis suggests the fabulous new single ‘I’m Leavin’ – "I’m not going to sing it, I’m going to do it!" It is such a great song - nearly Top 20 in the UK - and always good to hear in concert even if this is definitely not the best live version (although I am sure it sounded fantastic for the audience that night). 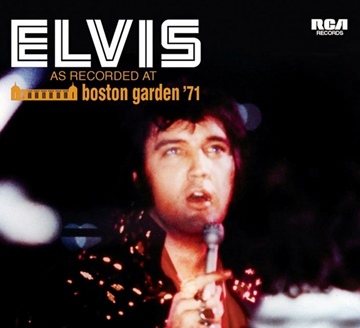 This Boston version is notable for the being the very last time Elvis would sing it until bringing it back to the set-list much later in February 1973. The song was obviously a favourite of Elvis’ as he would reintroduce the song back into his set-list and keep singing it until December 1975. ‘Bridge’ is as passionate as ever, with Elvis holding sway across the vast auditorium. The crowd screams in appreciation and Elvis must have felt it too since there is a rare and lovely reprise. Elvis then seems even more absorbed in the lyric as he sings, "Sail on silver girl, your time has come, oh Lord… to shine" and .. "I’m sailing right, right on, right on behind". It is a magic in-concert powerful moment and makes you really want to have been there in this Boston magnificence. All the more extraordinary is how, without a breath, Elvis keeps the energy level up, pushing straight onto the next song, a very fiery ‘I Can’t Stop Loving You’. ‘Love Me Tender’ is nicely done before the workout of ‘Suspicious Minds’. Here Elvis plays more with the adoring crowd & looses concentration singing, "Here we go again, boy did my mind went!" Later on and with some karate thrown in and Elvis is down on his knees & begging to the crowd, "Hope these pants don’t rip, Lord have mercy!" You know it was still THE showstopper! While this could have been the ending Elvis adds his sincere thanks to the crowd before a very nice ‘Funny How Time Slips Away’. Elvis says, "You’re a fantastic audience, Hope you enjoyed our show tonight" and you know he means it. During this very tasty & bluesy version of ‘Funny How Time Slips Away’ Elvis sings, "Gotta go now" and you can hear the crowd shriek "NO!" back at him. These are all nice touches, which add to the enjoyment and help demonstrate the appreciation of a non-casino crowd. With ‘Can’t help Falling’ Elvis is out & heading home – it all seems a little unbelievable that Elvis can create such a historic Boston legacy within a tightly-packed one hour. More from writer Jon Landau ..
"Elvis moved like a locomotive through the last four numbers, all recent hits, climaxing with a fine version of "I Can't Help Falling In Love With You". When it was over Charlie Hodge draped the cape over his shoulders, Elvis extended his arms so that the fiery orange formed that half-sun underneath him and he once again basked in his glory. He looked at the audience from every side of the stage and then he left. For one of the few times in my recent memory, I had witnessed a performance that had left me completely satisfied. Elvis has grown as an artist and any man who can do the show I saw him do last week doesn't have to apologise to any one for not singing the old songs or the songs someone else may want him to do." More on the November 1971 tour – from Stein Erik Star in his excellent book ‘The Concert Years’..
"Two months of rest had done Elvis good. It was an intense, committed and inspired Elvis who entered the stage with "That's All Right" - and conquered new territory in the east and the Midwest. The tours still represented something of a challenge - enough to make Elvis yet again take the audience's breath away with glittering shows. Some karate finishes on "Suspicious Minds" were so fantastic that the audience wouldn't stop clapping, like in Boston. 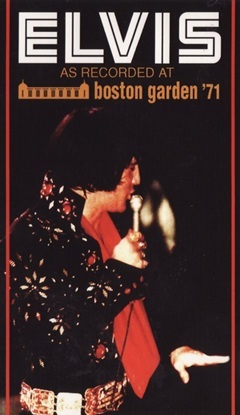 Boston also experienced that the introduction of "Polk Salad Annie" was again filled with humour and improvisation, and "Bridge Over Troubled Water" got such ovations at all of the concerts that Elvis often sang the last verse twice. The atmosphere during the shows was fantastic, and Elvis controlled the huge audiences completely - almost without saying a word. One lifted finger was enough to provoke a unison roar... Characteristic of Elvis' hold over the audience is the following little "conversation" in Louisville, in connection with Elvis performance of "I'm Leavin"': Elvis: "OK, I'm leavin"'. The audience yells back: "Nooo!!!!" Elvis: "I'm stayin', it's just a song." Overall Verdict - An essential FTD release of an old Bootleg favourite. Since RCA never recorded any 1971 on-tour shows professionally there are only a few concerts available for collectors and this is Elvis truly at his 1971 best. The FTD packaging with its 8-page booklet captures the look of Elvis on this tour - and Elvis is in rocking fine form. 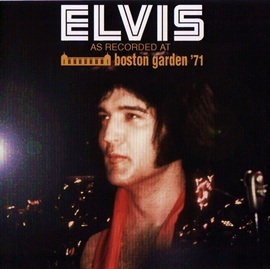 For the hard-core collectors, to be honest, there is little new here compared to Madison's 'One Night Only' earlier release - however for mainstream Elvis Fan Club members this is a GREAT release and at last a chance to hear Elvis at his best in 1971 - If you don't have a copy of Elvis At Boston Garden then you should! In the USA get it at the Graceland Elvis Shop. Recorded live, November 10, 1971, Boston, 8:30 p.m.
FTD CD Credits: Compilation and art directed by Ernst Jorgensen & Roger Semon.